Home > Questions > How can I fix deep chin crease and how much would it cost? Deep chin creases can be caused from hyperactivity of the mentalis muscle on the chin. The action of this muscle is to raise up, causing a dimpled chin and the mentalis crease, as pointed out in your photo. This is often softened with dermal fillers, and anti-wrinkle injections may be used as a preventative treatment. Dermal fillers are used to plump out the skin and replace lost volume. Dermal filler injected directly into the mentalis crease can help pop the skin back out, where it is creased into the skin. Dermal filler in this area also acts as a “blocker” for the mentalis muscle to push the chin up. Patients who have a mentalis crease often have an up-turned chin. Placing dermal filler in this area also gives the benefit of elongating the chin back down. 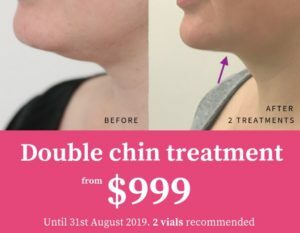 The chin often take 1-2mls of dermal filler and 1ml starts from $650. The chin can last up to 12-18 months, depending how much filler is injected in the chin. If there is still a visible crease in the chin after your dermal filler treatment, other modalities such as derma pen, fractional lasers and peels may assist in minimising the static line. 4-8 Units of anti-wrinkle injections can also be injected at the same time as your dermal filler treatment to prevent the mentalis muscle from pushing up, attributing to the chin crease. Results take 2 weeks to see the full effect and can last up to 3 months.